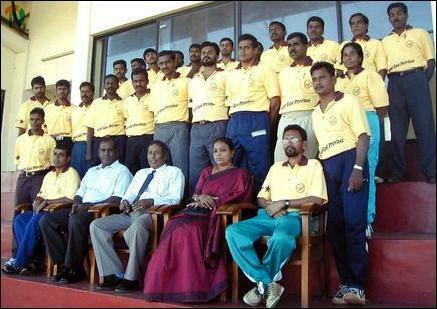 New recruits including ten sports coaches and sports officers are to assume duties from January 1st 2004 in the districts of Jaffna, Trincomalee and Amparai to ease existing shortage of coaches and sports officers in the northeast, sources said. Mr.Thiagalingam appealed to sports coaches and officers to identify talented players and athletes in their respective areas and facilitate participation at national level competition after necessary training. To achieve this aim sports coaches and officers should prepare an action plan at the divisional secretariat level. Provincial ministry of sports is prepared to assist those coaches and officers in this regard, Mr.Thiagalingam added. He said, of the 24 districts in the country, eight are in the northeast province. “This means at the national level competitions northeast should bag at least one third of the first places. But this was not so because of lack of proper and modern training and guidance by coaches and sports officers to our sportsmen and women,” said Mr.Thiagalingam. “Sport activities have been playing a vital role in developing healthy understanding between communities. Sports could be the foundation to developing leadership qualities. Peace and reconciliation between communities could be established in the country through cultural and sports activities," Mr.Thiagalingam told the participants of the programme. Sports Ministry Project Officer for soccer Mr.M.K.Abeyasinghe appealed to the provincial ministry of sports to allocate enough funds for the development of sports in the northeast to identify and train talented youths in sports activities to compete at national level competitions. The National Coach for Athlete Mr. Sajith Jayalal also spoke.